The students were able to out answer the five other competitors in the Finals with a total of 22 points to gain the top spot in the competition, winning the Thomas Saunders Trophy, along with $250 each in cash. 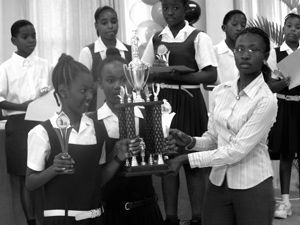 With a total of 20 points, the Kingstown Anglican School, represented by Twana Clarke and Jolecia Hazel, captured the second place, winning $200 each, while the Kingstown Preparatory School, represented by Justin Robinson and Kyle James placed third, with 18 points, and wining $150. The students were quizzed on General Knowledge, Sports, Credit Union Affairs, Current Affairs and History in three different rounds, including multiple choice, open question and a buzzer round. Speaking at the quiz on Saturday, Chairperson of the KCCU Education Committee Cicyln Joseph said that over 30 primary schools participated in the preliminaries, from which six schools emerged as finalists in the competition. She also stated that the quiz gives the students a forum at which to share their knowledge and skills. Joseph also encouraged the students to save the money that they won in the competition, and when they have enough they should put it into a credit union.